The virtualization monitor is a specialized variation of the usage monitor mechanism that provides monitoring functionality specific to virtualization-related usage. A variety of virtualization monitors can be used to perform different forms of monitoring. Virtualization monitors are typically implemented as service agents. Hypervisors are installed on the three physical servers. Virtual servers are created by the hypervisors. A shared cloud storage device containing virtual server configuration files is positioned so that all hypervisors have access to it. 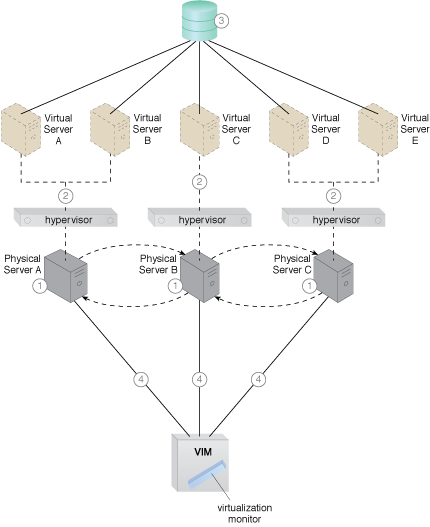 The hypervisor cluster is enabled on the three physical server hosts via a central VIM, and monitored by the VIM’s virtualization monitor function. Figure 1 – A virtualization monitor that is part of a VIM monitors a hypervisor cluster.